"...Perhaps Moye's own experience playing Phillips accounts for the fact that the legendary producer, whose ear for raw talent and wizardry for blending rhythm and blues and country into rock classics, seems more at the center of this story than in past productions I've seen. Or it may be that the Marriott's in-the-round configuration just works well at putting him literally in the center of things. (Since the cast plays all the instruments, set designer Jeffrey D. Kmiec transforms the theater's glass-walled musicians' nest into the recording booth for Sun Records.) Heck, Phillips is even played by David Folsom - surely a lucky name if you're playing the man who discovered the Man in Black and recorded Cash's "Folsom Prison Blues."" "...Everybody gets a showstopper, but the showstopping-est numbers belong to Zegree's Lewis. He leaps over the piano like it's a hurtle at a track meet, playing the whole time, never missing a beat. He plays while doing a handstand on top of the keys (a short one, but still). He is never still, jumping and twitching like boll weevils in high cotton, and he pulls it off without making any of it seem like a stunt. It's not just energy; there's urgency to Zegree's Jerry Lee. He plays like he's running out of time." "...Just call "Million Dollar Quartet" the "little jukebox musical that could" -- especially in and around Chicago. Now making its Marriott Theatre debut in Lincolnshire, the musical has already extended its run due to audience demand." "...Let’s Play ‘Highly Recommend’ that you take the trip out to Lincolnshire, IL, to see this incredible jam session that will have you up on your feet ’ and ’ all night long." "...Marriott Theatre in Lincolnshire is doing this show in the round, as they do with all of their productions. After seeing countless productions of this show, I was very curious as to how they could pull this off. How could people sitting on four sides of the stage bear witness to the craziness of one Jerry Lee Lewis and his antics at the piano. Well, hats off to director James Moye! He pulled it off to perfection." "...At the Marriott Theatre we have one more tribute to the musical’s intergenerational popularity and success, while reminding us of this company’s consistent theatrical artistry. As the entire talented cast reminds us: “Great Balls of Fire,” in Lincolnshire there’s a “Whole Lotta Shakin’ Goin’ On!”"
"...The first night audience obviously was ready to have a good time and the opening "Blue Suede Shoes" number got the rapport between spectators and performers off to a roaring start. The music has not aged in almost seven decades. It may have split the generations in the 1950's but we can look back on the time as a classic era, not just nostalgically but musically. The Marriott revival has done its part to keep the music and the personalities fresh. At the end of the evening, the performers delivered a musical epilogue of four rock hits that had the audience standing and applauding. It was "Dancing Queen" rock 'n' roll style. You had to love it!" "...The Marriott Theatre in Lincolnshire, with its storied “in the round” setting (really, it’s a square), is perfect for this production. Jeffrey D. Kmiec‘s simple Sun Records studio set onstage is augmented, since the actors supply all the live music, by use of Marriott’s usual orchestra pit behind section one as the studio’s sound booth. But make no mistake, the shakin’ goes on front and center." "...But the reason to go to the show is to hear and see those four personalities come alive during an extraordinary 90 plus minutes jamming of "I Walk the Line," "That's All Right (Mama)," Who Do You Love," "Great Balls of Fire" and their other hits." "...Million Dollar Quartet is a very entertaining night at the theatre, and the Marriott, with its square stage surrounded by audience members, is an excellent venue to see (and hear) it. It’s easy to see why this show played for years at the Apollo, and now those who missed it (or just want to revisit it) have another chance. And it is well worth going out on a chilly night to be warmed by the pure rock and roll of these four young performers who made history, played by actor/musicians who are excellent in every way. You’re gonna love it." 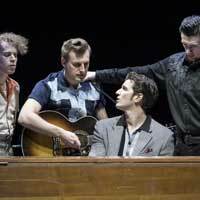 "...“Million Dollar Quartet” has a long-standing love affair with Chicago audiences. There have been sell-out productions dating back over a decade — at Goodman, and then the Apollo for years — to only a few years ago, at Paramount, and many in between, a testament to just how rugged and resilient this rock 'n’ roll juggernaut is. You will like the experience of all the sights, sounds and gyrations in the Marriott's unique round configuration, where the studio sound booth is ingeniously incorporated into Jeffrey D. Kmiec's design freeing up the stage area for the session artists and backup instrumentalists to nest in the corners when things start rocking. With Teresa Ham’s gorgeous costumes, lighting by Jesse Klug and sound by Robert E. Gilmartin, it fits like a new pair of “Blue Suede Shoes.”"
"...Stunning vocals and a catchy score of hits make Million Dollar Quartet, in this writer’s opinion, a show to see. Marriott Theatre creates a rock concert that invites you to jump on your feet and dance along which, at this opening performance, everyone most certainly did."